While the environment is hugely important, the Vail Homeowners Association urges that sustainability should have a broader, more comprehensive goal that embraces all aspects of the community. How to become a sustainable community? It would seem that a first step would be a critical, realistic examination of Vail’s “carrying capacity.” Vail will never be a typical urban community, nor would most want that to be the case. Vail’s charm lies in the fact that it is a mountain retreat nestled in a beautiful valley. As such, there is a finite limit to Vail’s capacities. Infrastructure and facilities can impact those capacities, but it would seem that Vail should not seek simply to get “bigger” as part of a sustainability strategy, or at least, that is a question that should be answered at the outset. After all, a goal of “bigger” ultimately is never sustainable. A step in that direction occurred when Vail Resorts opened Blue Sky Basin. At that time, there was an assessment of mountain capacity at 20,000 skiers. Not much is known about how that number was determined, but it was reduced to writing in an agreement between Vail Resorts, the town and the Forest Service. However, it was a limit without meaning because there is no enforcement process and no consequences if that number is exceeded. Another “step” in that direction occurred when Vail obtain limited permission from the Colorado Department of Transportation for overflow parking on the Frontage Roads. Again not much is known about how the limits on that parking were determined, and in recent years, they have been quietly expanded. And when it came to summer use, Vail just allowed on-street overflow parking without any permission. Now, what started out as a limited temporary relief measure has grown into a significant public safety issue. These are not the kind of assessments that should drive a sustainability goal. Any capacity assessment should be real and transparent with objective criteria and benchmarks. If there is no accountability, limits are meaningless. Voters have already had to impose limits; once in 2005 when a convention center was rejected in Vail and in 1972 when Colorado voters rejected the Winter Olympics. It would be better to have a plan so that citizens don’t have to resort to the ballot box to impose limits. 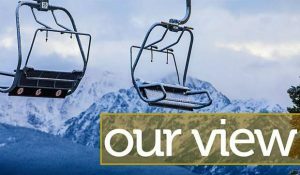 The proposed upsizing of a previously approved redevelopment of the Roost Lodge site may well spark a sustainability debate over residents’ concern about locating high-density redevelopment projects in existing West Vail residential neighborhoods and elsewhere throughout the community. Another step would be to solve Vail’s pressing problems in ways that would create a sustainable path for the future. Action is already underway to clean up Gore Creek and restore it to Gold Metal status. Roadway and transportation infrastructure improvements are, likewise, underway to provide for the future, with Vail having already achieved a “silver” status for its biking improvements. But there has yet to be action on some of Vail’s other pressing problems.